[INQ. NO. 1508M16] Since its launch in 1991, Jinsung Refrigerator has been professionally engaged in manufacturing refrigeration equipment and eutectic cold tops. Jinsung Refrigerator’s eutectic cold top is appropriate for use in hot climates, where eutectic cold top vehicles for freezing storage can reduce fuel costs, environmental pollution and operational noise. With it, users do not need to operate a refrigerator attached to the car engine. When operating the refrigerator with AC power (220-380V), the PCM (Phase Change Material) panel inside the cold top is slowly cooled down to -45°C, thus being charged with chill. While the vehicle is running, the stored chill is slowly emitted, thus stably keeping the interior temperature at -30~-20°C. It is strongly recommendable for users wishing to transport frozen food, ice cream, seafood, etc. in hot climates. Thus, the refrigerator is operated regardless of the car engine’s operation. Given that high oil prices are increasingly appearing as one of the major obstacles in normally operating businesses, the product is gaining a very good reputation among these industries. Jinsung Refrigerator is seeking to increase the size of the existing flagship markets including the Middle East, Russia, Australia, Brazil, Hong Kong, etc, while further pioneering new potential markets such as the U.S.A, Europe, North Africa, etc. [INQ. NO. 1501M07] Since its launch in 1991, Jinsung Refrigerator has been professionally engaged in manufacturing refrigeration equipment and eutectic cold tops. Jinsung Refrigerator’s eutectic cold top is appropriate for use in hot climates, where eutectic cold top vehicles for freezing storage can reduce fuel costs, environmental pollution and operational noise. With it, users do not need to operate a refrigerator attached to the car engine. When operating the refrigerator with AC power (220-380V), the PCM (Phase Change Material) panel inside the cold top is slowly cooled down to – 45°C, thus being charged with chill. While the vehicle is running, the stored chill is slowly emitted, thus stably keeping the interior temperature at -30~- 20°C. It is strongly recommendable for users wishing to transport frozen food, ice cream, seafood, etc. in hot climates. Thus, the refrigerator is operated regardless of the car engine’s operation. Given that high oil prices are increasingly appearing as one of the major obstacles in normally operating businesses, the product is gaining a very good reputation among these industries. Jinsung Refrigerator is seeking to increase the size of the existing flagship markets including the Middle East, Russia, Australia, Brazil, Hong Kong, etc, while further pioneering new potential markets such as the USA, Europe, North Africa, etc. Since its launch in 1991, Jinsung Refrigerator has been professionally engaged in manufacturing refrigeration equipment and eutectic cold tops. 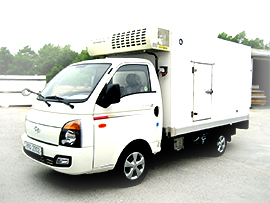 Jinsung Refrigerator’s eutectic cold top is appropriate for use in hot climates, where eutectic cold top vehicles for freezing storage can reduce fuel costs, environmental pollution and operational noise. With it, users do not need to operate a refrigerator attached to the car engine. When operating the refrigerator with AC power (220-380V), the PCM (Phase Change Material) panel inside the cold top is slowly cooled down to -45°C, thus being charged with chill. While the vehicle is running, the stored chill is slowly emitted, thus stably keeping the interior temperature at -30 ~ -20°C. 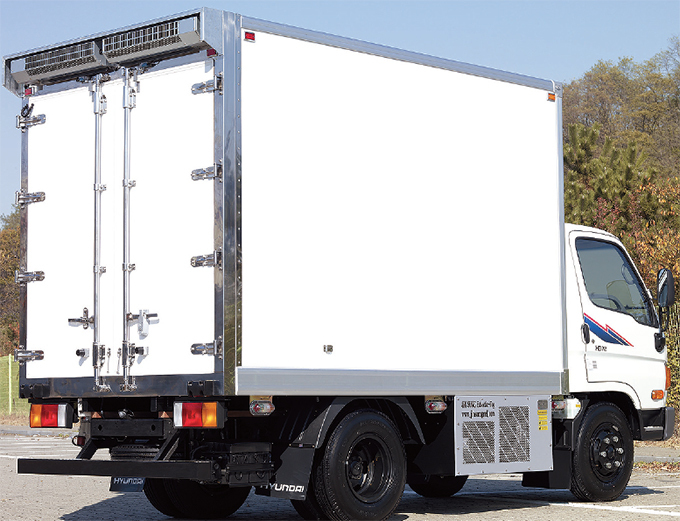 It is strongly recommendable for users wishing to transport frozen food, ice cream, seafood, etc. in hot climates. [INQ. NO. 1401M16] Launched in 1991, Jinsung Refrigerator has since then been professionally engaged in manufacturing refrigeration equipment and eutectic cold tops. The company’s eutectic cold top is suitable for use in hot climates, where eutectic cold top vehicles for freezing storage can reduce fuel costs, environmental pollution and operational noise. With it, users do not need to operate a refrigerator attached to the car engine. When operating the refrigerator with AC power (220- 380V), the PCM (Phase Change Material) plate inside the cold top is slowly cooled down by -37°C, thus being charged with chill. While the vehicle is running, the stored chill is slowly emitted, thus stably keeping the interior temperature at an average -30~-20°C. It is strongly recommendable for users wishing to transport frozen food, ice cream, seafood, etc. in hot climates. Thus, the refrigerator is operated regardless of the car engine’s operation. Given that high oil prices are increasingly becoming a major obstacle to normally operating businesses, the product is gaining a very good reputation among these industries. The company is further seeking to broaden the existing giant global markets especially in the Americas and Europe. Filed Under: Machinery Tagged With: Eutectic Cold Top, eutectic cold top vehicles for freezing storage, Jinsung Refrigerator Ind. Co. Ltd. Launched in 1991, Jinsung Refrigerator has since then been professionally engaged in manufacturing refrigeration equipment and eutectic cold tops. The company’s eutectic cold top is appropriate for use in hot climates, where eutectic cold top vehicles for freezing storage can reduce fuel costs, environmental pollution and operational noise. With it, users do not need to operate a refrigerator attached to the car engine. Thus, the refrigerator is operated regardless of the car engine’s operation. Given that high oil prices are increasingly appearing as one of the major obstacle factors in normally operating businesses, the product is gaining a very good reputation among these industries. Jinsung Refrigerator is seeking to broaden the existing giant global markets especially in the Americas and Europe. Filed Under: KOTRA Tagged With: AC power, Eutectic Cold Top, Jinsung Refrigerator Ind.